Adrian at L’Abbruzzese has introduced me to an expanded range of their organic, Australian pastas. Made in Adelaide by an Italian family, these are the best dried pastas I know of and are so reasonably priced, compared to others I have seen. See more here…..
Everyone loves the olives that Lina sends me from their farm, just north of Adelaide. Pat and Lina use no chemicals and just the old fashioned, Italian way of extracting the bitterness from raw olives by soaking them in barrels for months and months. The greener, jumbos take up to 9 months to be ready! Read more here…. Shani helps me at the first market of each month and this Sunday we will have on my stall some of her fantastic, hand made pot holders and pot scrubbers, all made from recycled fabrics and fibres….. as well as her 100% natural Soap for Gardeners. I have bought some of each and can highly recommend them. These would all make fabulous, unique and beautiful presents too. Vitamins are made by living things (plants and animals). Minerals come from the soil and water and are absorbed by plants and eaten by animals. If the soil lacks minerals, so will the plants (and animals) you eat and so will you. Low magnesium is something many people have. Read more here…. Again you would be best to be to the market early to get some of Hugh’s very popular lamingtons, vanilla slices, lemon tarts and GF sourdough breads at my stall. No matter how much he makes, it always sells out! More than 20 people came to our second gathering, on the Saturday morning of August 12th. It was a a blast, with 2 tables packed to overflowing with plants, seeds, produce, baked goods, books, lemons, rhubarb and more. Everyone was smiling. It was such a great vibe. Kevin and Cindy’s fabulous, new season’s organic, sundried fruits are selling like hotcakes! Read more here and my recipe…. Lisa grows saffron on her beautiful farm at Glen Huon. I am now stocking her glass jars of saffron and her recipe cards. Economic jar refills are also welcome. This is my kind of ethical philosophy! Read more here….. Nuts, chocolate, brandy….sounding good already? 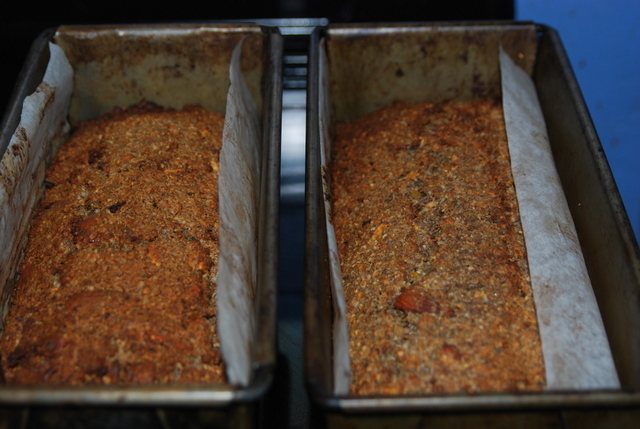 I think my pan forte is the best and it is mostly organic; being made using all my GaSP ingredients. All my panfortes are naturally gluten free. Available at the market: Slices to nibble with coffee / halves to take home. Orders for whole panfortes will be ready to collect on my home shop open days (see above) starting Thursday Dec. 3rd. The only ingredients in the entire history of the earth since the big bang that contain gluten are these cereals; wheat, barley, rye, some oats and a few less well-known grains such as khorasan, spelt etc. The history of the human includes a diet almost exclusively gluten free until the beginning of agriculture about 8,000 years ago, when, in The Middle East, people started saving and sowing the seeds of some grasses. We ALL benefit from ensuring our diet contains the broadest range possible of grains, just as our ancestors did. We ALL benefit from removing processed grains of every sort from our diet and replacing them with whole grains, as our ancestors did. In doing that, we need to learn how to cook them, just as our ancestors had to. Buckwheat is a bush, not a grass and therefore has no gluten. The seeds are small, pretty and pyramid like. It grows well in cool climates with an acid soil and dislikes too much nitrogen. It is native to China and is a good crop for Tasmania. I sell buckwheat grown in northern Tasmania. 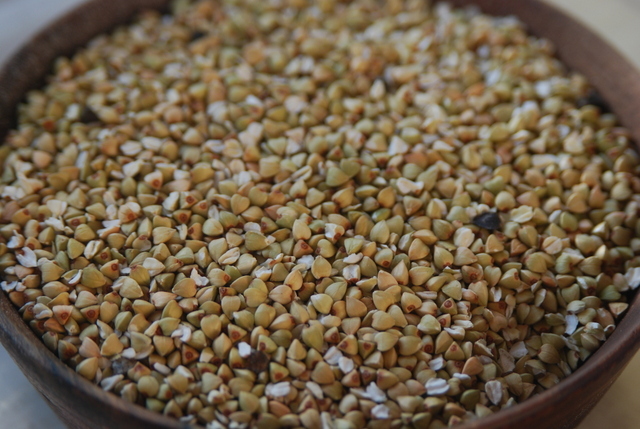 Buckwheat can be used as a whole grain or ground into flour. It has become popular all over the world as peasant food because it is so easy to use. In south west France buckwheat pancakes with Roquefort cheese are a speciality not to be missed! 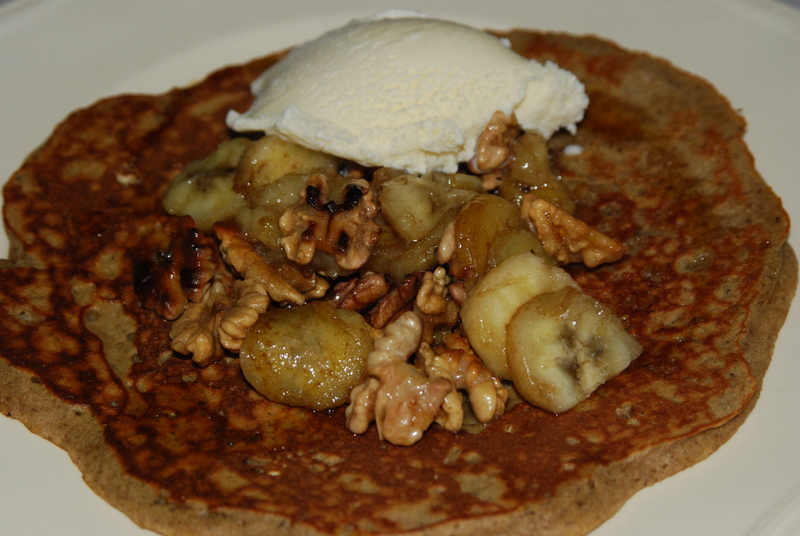 Here is my recipe for quinoa and buckwheat pancakes with hot, buttered walnuts. Phytic acid in grains, nuts, seeds and beans represents a serious problem in our diets. This problem exists because we have lost touch with our ancestral heritage of food preparation. Some people eat a lot of high-phytate foods like commercial whole wheat bread and all-bran breakfast cereals. But raw or instant are definitely not Nature’s way for grains, nuts, seeds and beans. . . nor are quick cooking or rapid heat processes like extrusion. Buckwheat and rye are very high in phytase which is the enzyme that neutralizes phytic acid and liberates the phosphorus. This enzyme co-exists in plant foods that contain phytic acid, in varying amounts from very low to very high. In general, humans do not produce enough phytase to safely consume large quantities of high-phytate foods on a regular basis. However, probiotic lactobacilli, and other species of the endogenous digestive microflora can produce phytase. Thus, humans who have good intestinal flora will have an easier time with foods containing phytic acid. Sprouting also activates phytase, thus reducing phytic acid. The use of sprouted grains will reduce the quantity of phytic acids in animal feed, with no significant reduction of nutritional value. Soaking grains and flour in an acid medium at very warm temperatures, as in the sourdough process, also activates phytase and reduces or even eliminates phytic acid. Combining a high phytase grain, such as rye or buckwheat, when soaking other grains, nuts legumes can help increase the phytase and thereby decrease the phytates present after soaking. 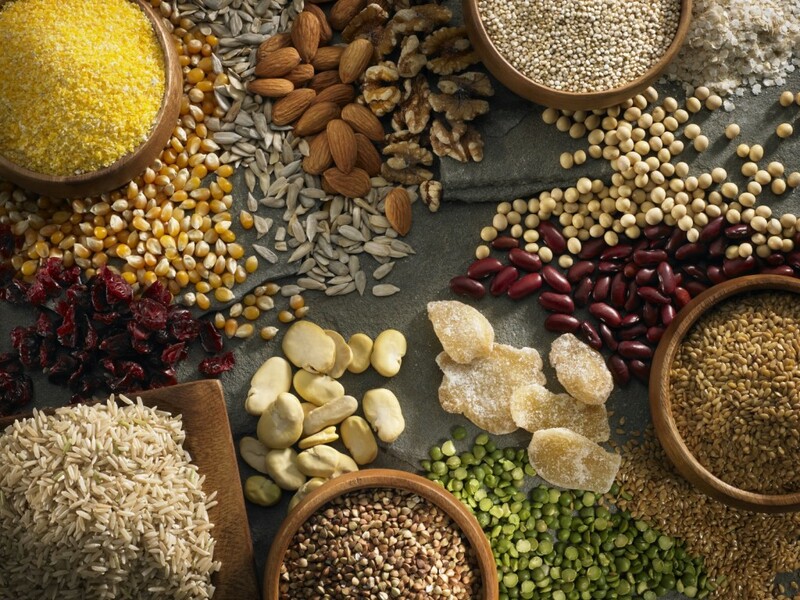 Here is a wonderful article on phytates, phytase and how to eat grains, nuts and legumes. Hugh did gluten free baking for 5 years in his Hughsli business in Adelaide and he is going to share his tips and recipes with us in this workshop He will change your opinion that gluten free food is boring, restrictive and complicated! Instead you will be amazed how easy it is to use naturally gluten free ingredients. 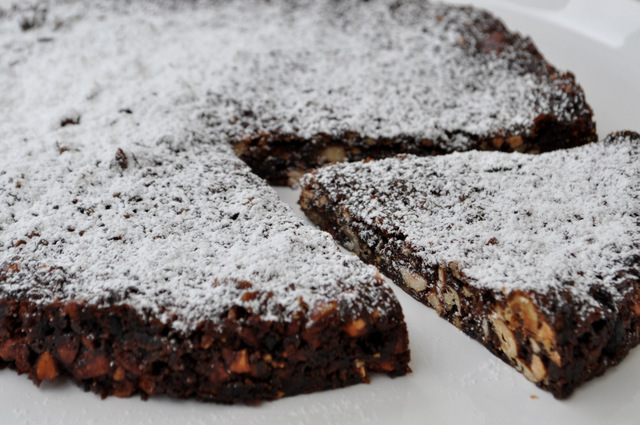 Many of his recipes are also sugar free and equally delicious. I have been wanting to a gluten free breakfast workshop for ages as I accidentally discovered that many of my favourite breakfasts are naturally gluten free. The Saturday afternoon will be discussion about and creation of Hugh’s specialities which blends well with the preparation of my gluten free breakfasts. Sunday morning will be a feast of our freshly prepared foods fit for a king. The workshop includes all the recipes and I offer 10% off everything purchased at The Garden Shed and Pantry during the workshop. Most of the ingredients we use are things I already sell. Add your EMAIL (not your name) to the booking sheet here. Go straight to the booking sheet for dates and to add your email address. Click here for more info. on my sourdough workshops. 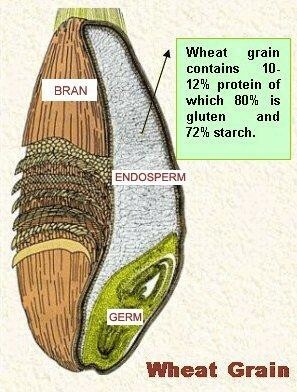 The diagram below shows you that gluten is part of every grain of wheat. It is a certain kind of protein which exists in all cereal grains, not just wheat. A gluten free diet always focuses on the removal of wheat, rye, barley, spelt (and sometimes oats). People often feel that the rug has been pulled out from under their lives as processed foods so often contain one or other of the cereal grains. Don’t worry! You can eat everything else in the entire world, including rice, quinoa, buckwheat, lentils, chick peas, meat, vegetables, fruit, nuts and seeds! Breakfast is often the biggest problem. When you look at the cereal isle in the shops you can see why… and it IS called the CEREAL isle, which tells you exactly what you’ll find there; cereal grains and therefore gluten! I believe it is best not to eat too much gluten, even if you do not have a gluten problem, as it can be irritating to the human gut and lead to future problems. Sourdough bread has less gluten that bread made with commercial yeast because of the fermenting process that uses up some of the gluten. Oats can be tolerated by most people but it is best not to always have the same thing every day or you may develop problems with it. I often start the day with congee (recipe below) and / or a kefir and fruit smoothie. Some days I have quinoa and buckwheat pancakes with fruit, maple syrup and yoghurt. For a savoury start, try chickpea flour pancakes with tomatoes and mushrooms or tahini and avocado. One of my favourite breakfasts uses cooked greens in place of toast, and is topped with a fried egg and mushrooms or smoked salmon. There is no need to fret over a gluten free diet. Stay away from packaged foods altogether and most of your battle is over. 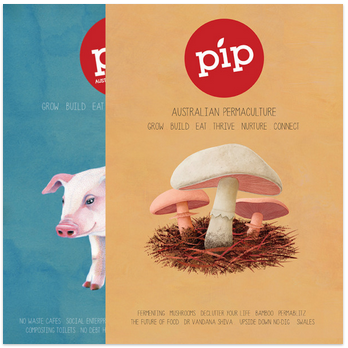 I have lots of delicious and simple breakfast, lunch, dinner, cake, biscuit and dessert recipes the whole family will love that use ingredients from The Garden Shed and Pantry’s range of organic, Australian wholefoods and ingredients, most of which are gluten free. You can always find up-date (mostly!!) GaSP products and prices on the products page of my website. Don’t forget to buy organic seeds to sprout as most supermarket stuff is irradiated on entry to Australia and is dead so will not sprout. 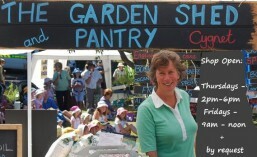 You will find $5 packs of several organic seeds at The Garden Shed and Pantry home shop and market stall. More sprouters have just arrived! Get one soon! Bamboo gardening gloves are made from a wonderful, breathable fabric for summer gardening. Hard wearing and a sustainable product too. Lovely gift for the earth-wise gardener. This beautiful, slow cooked rice porridge dish is common in China. Its benefits come in the long, slow cooking, in much more liquid than you normally use for rice. It is easily digested and a perfect start to the day. Only one extra ingredient should be added, to give your gut the full nutritional benefits and not bombard it with too much work first thing in the morning. Fragrant brown rice is best but any brown rice will be great. I use the long grain, rain-fed, organic, Australian brown rice I sell (but am currently awaiting the new season’s crop in April).